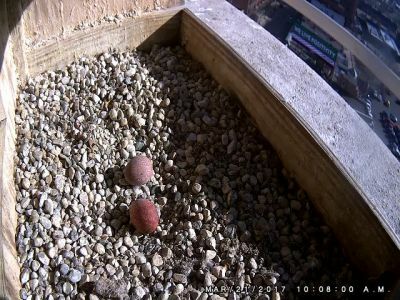 Rebecca laid the second egg early in the morning on Tuesday, 3/21/2017, which is the same date as the second egg in 2016. Both Rebecca and Kewpee have spent time incubating the eggs. Often they do not consistently incubate until there are more eggs, but it has been cold, so the temperature may determine how much time they spend keeping the eggs covered. We will watch to see how many more eggs there are this year. Watch for another on the 23rd or 24th.